The Edmonton Remand Centre (ERC) Newspaper is a daily record of chalk messages, written by family members and friends of the ERC inmates, on the sidewalk outside the Edmonton Remand Centre. Anyone can write a message in The ERC Newspaper. The content changes daily as the messages are washed away by The ERC janitorial staff. 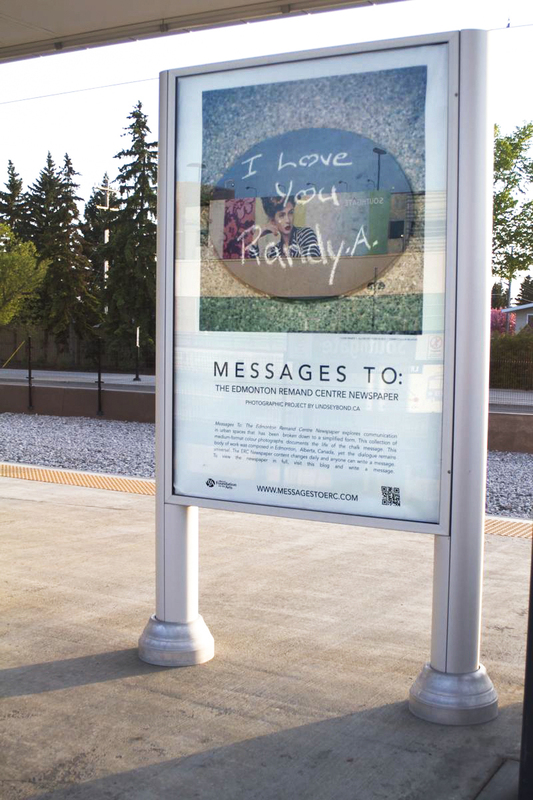 Messages To: The Edmonton Remand Centre Newspaper explores communication in urban spaces. This collection of medium-format colour photographs documents the life of the chalk message and begins to access the complex situation of Remand Centres, while offering a lasting record of fleeting sentiments. Messages To: is currently taking form through a book, a series of post cards and a transit art installation; posters displayed in the advertisement slots in the Land Rail Transit (LRT) Stations across Edmonton. Messages To: works to open up a public discourse about the Bill C-10 “Safe Streets and Communities Act” and acknowledge the individuals and families being effected by the relocation of the Edmonton Remand Centre. The Transit project will be displayed from May 07- June 07, 2012. Look for the posters in the Edmonton LRT Stations! The Book will be printed and released at the Book Launch on May 26 @ 5pm, at Latitude 53 Contemporary Visual Culture (10248 – 106 Street Edmonton, Alberta T5J 1H7 CANADA). I began Messages To: in Edmonton during the spring of 2011, while riding my bicycle beside the railway tracks. There, I became aware of the erasure of visual renderings: chalk messages written by one and daily washed away by another. Nagged by these marks created to communicate messages of love, support and anecdotes, I began to spend more time with the messages and found they reflected the impact of a greater social circumstance occurring in downtown Edmonton. Questions came to my mind such as: Is this a new or archaic system of communication? How has this act of writing filled a void within this community? Through the lens of my Hassleblad camera, these images were created to not only docuement the great warmth and bold honesty worn on the sleeves of the downtown community, but to create an outlet for the innercity voice. It is my hope the messages will enter back into the public visual culture where they will remain and recall the need for people to connect in urban spaces; to expose the basic human need to be heard despite circumstance.